“As Burma is going through difficult times, I hope that the Chinese people give us more understanding and don’t only see us as a business opportunity,” said the Nobel Laureate. 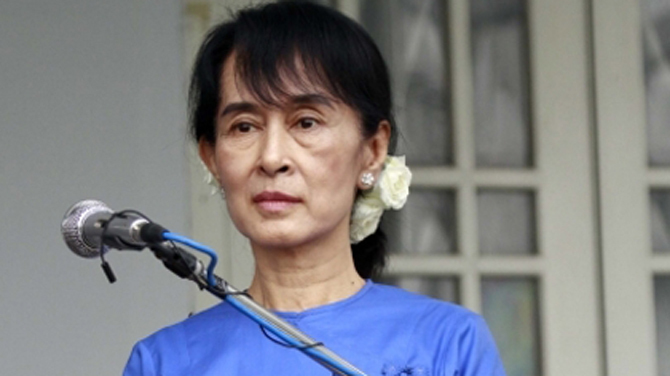 Suu Kyi did not leave the realm of diplomatic cordiality when asked what role Burma should play when juggling both India and China with renewed diplomatic efforts by the United States. However, she insisted that the priority was embarking on a program of national reconciliation before looking harder at international relations. But Suu Kyi did not see any conflict with developing close ties to both China and the United States. China has long been Burma's biggest investment partner throughout decades of Western economic sanctions—ploughing billions of dollars in a series of mining, power and infrastructure projects. However, the mood has changed somewhat in recent times with the postponement of the Chinese-backed Myitsone hydropower project, angering Beijing, and warmer noises emanating from Washington in the wake of nascent democratic reforms by Naypyidaw. Suu Kyi rejected the concept of “Asian values,” as opposed to what some observers see as overly individualistic Western values, by saying that different Asian countries have very different priorities and characteristics. And she dismissed the idea that Western sanctions prevented the emergence of a middle class in Burma—an argument frequently heard in Chinese academic and official circles. Instead of blaming sanctions, Suu Kyi described cronyism as a “tumor” which holds back the emergence of a middle class in Burma. The interview with Chinese national weekly Southern People was only recently published despite being conducted last year, according to a source close to the magazine. The Guangdong-based publication sent reporter Yang Xiao to Rangoon to interview Suu Kyi in English, but her report was later published in Chinese. Suu Kyi was interviewed by influential Chinese language magazine Asia Weekly on Dec. 19, but refused to discuss the content of her meeting with Chinese ambassador Li Junhua earlier that same month.The hour-long discussion on Dec. 8 was Beijing's highest level meeting with a Burmese opposition figure in two decades. Suu Kyi said that she was very willing to travel to China, a country she has never visited, but has not yet received an invitation.